Rumour has it that San Francisco based Philip Kaufman will be directing an HBO film about Ernest Hemingway and his relationship with Martha Gellhorn entitled Hemingway and Gellhorn, starring Clive Owen and Nicole Kidman. Reportedly shooting begins this year using SF locations such as Pier 80, which is surprising because no one knows of Hemingway spending any time there. Key West, Cuba, Paris, and the Northwest yes, SF not so much. 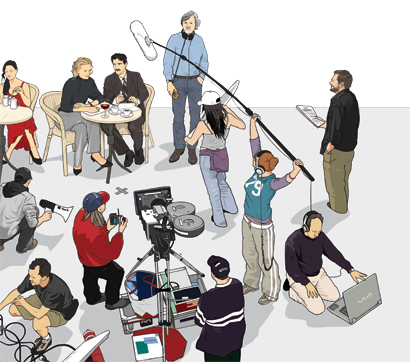 San Francisco magazine commissioned this illustration of Kaufmann directing a scene at an SF street café for the cover of January's issue.